INTEROUTE is proud to fly the colours of Boulangeries PAUL on Luxembourg's roads. Why? How? What are the advantages for the company? 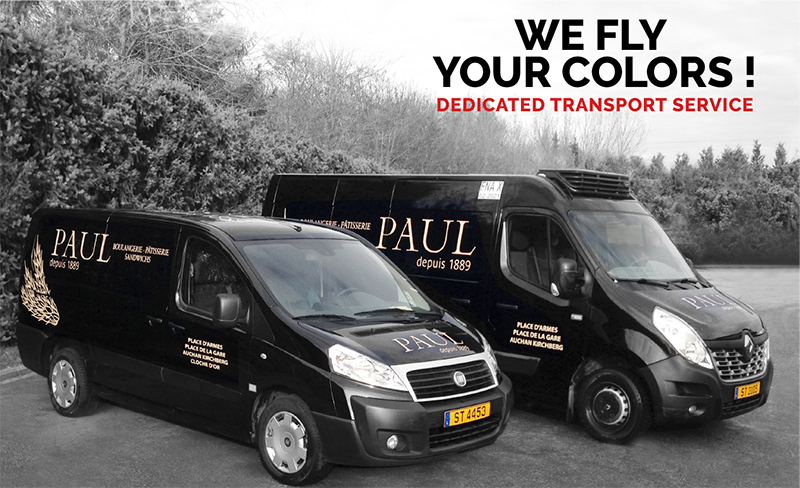 After studying the complexities of Boulangeries Paul's situation we decided to take over the management of their drivers and the two vehicles they had in the company's livery. The development of the company is aided by an adequate fleet of vehicles. If you are looking for a suitable and effective solution for outsourcing your shipping, please contact us! Do you need a transportation service, but you don't want to use a standard distribution channel? Do you use a fleet of vehicles but you don't want to take care of its management? Are you tired of incidental costs on your vehicles and personnel management? After reviewing your specific equipment needs and resources, we can invest for you in the vehicle or vehicles necessary for your transportation and deploy the number of drivers necessary for carrying out transport on your site. Such a configuration covers your transport needs 24/7, organised in a way that suits you, at a fixed price, completely transparently. For more information, please visit the dedicated transport service page or contact us!